Fred Harvey is a bit of a legend in the hospitality industry. Back in 1876, long before railroad dining cars were part of the rolling stock, he realized the need for restaurants along the major rail routes. To remedy the situation, he negotiated a contract with the Santa Fe Railroad, and opened the first of many Harvey Houses along the mainline. These restaurants were known for their generous portions and quality furnishings, and of course the Harvey Girls, who fed hungry passengers in the time it took to service the trains and change the crews. As time went on, Harvey expanded his empire to include hotels and resorts, and at the time of his death he operated 47 restaurants and 15 hotels. And although many of these historic properties have faded into oblivion, you can still find remnants of the Harvey empire throughout the Southwestern US. Some buildings are in ruins, while others have been renovated; and there are even a select few where you can spend the night. And although access wasn’t a consideration during Fred Harvey’s lifetime, thanks to some access upgrades, today wheelchair-users and slow walkers can enjoy some of the remaining properties. There’s no better place to begin your Harvey House scavenger hunt than in Kingman, Arizona, which was once home to the Santa Fe Eating House. Unfortunately all that remains of this iconic structure are a few remnants of the foundation. That said, this site is still worth a stop, as the beautifully restored Santa Fe Depot is located across the street, on the corner of 4th Street and Andy Devine Avenue. There’s accessible parking in the small lot, with ramp access up to the 1907 depot. The Whistle Stop Railroad Club (928-718-1440) operates a small museum with three model train layouts on one side the building, while the Amtrak waiting room is located on the other side. There’s level access to the depot and the museum, and accessible restrooms inside the depot. It’s definitely worth a stop for history buffs, as the building is on the National Register of Historic Places. The Williams Depot, which is located about two hours up the road, is also worth a stop, as it was once the site of the Fray Marcos Hotel. The Harvey House and adjoining depot were opened to the public in 1908, and at its peak it had 43 guest rooms. Today the depot is still in operation, while the former hotel houses the Grand Canyon Railway administrative offices. The best way to find the depot is to take Grand Canyon Boulevard past the Grand Canyon Railway Hotel, then follow the signs to “ticketing”. Accessible parking is available near the depot, with level access to the track side of the station. Take some time to admire the exterior, then pop inside for a look at the former Indian Building — you can’t miss it, as it’s the room with the massive fireplace. The old hotel lobby is adjacent to the Indian Building, next to the stairs that lead up to the Grand Canyon Railway offices. There are some old photographs in the lobby, which has a definite historic feel to it. Although the depot is deserted most of the day, traffic picks up at 9:30 A.M. and 5:45 pm, when the daily Grand Canyon train arrives and departs; but with a little advance planning, you’ll have the place to yourself. Grand Canyon National Park, which is located north of Williams, is home to two historic Harvey Houses. Perched on the south rim of the canyon, El Tovar and Bright Angel Lodge both feature Mary Colter’s signature southwestern touches. El Tovar (888-297-2757, www.grandcanyonlodges.com/lodging/el-tovar/) first opened in 1905, and although it was considered a luxury hotel, guests still shared one bathroom at the end of the hall. Today the property boasts modern access features, including a ramped accessible entrance on the canyon side. 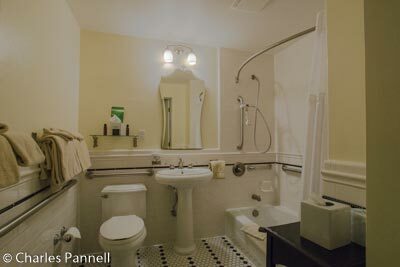 Rooms 6439 and 6441 feature good pathway access, and both bathrooms are equipped with a tub/shower combination with a hand-held showerhead and a portable shower bench. 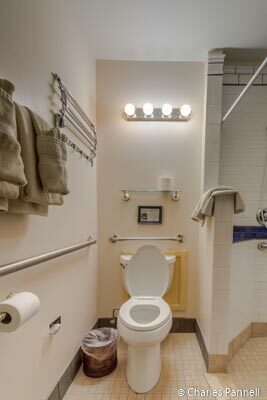 Other access features include toilet and shower grab bars and a pedestal sink. 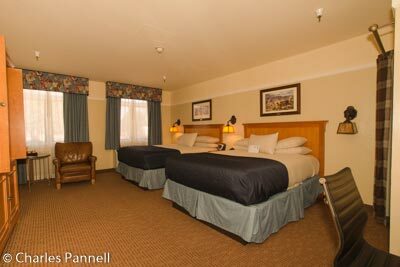 Room 6439 is furnished with a 27-inch high king-sized bed, while room 6441 is a little larger and includes two 28-inch high queen-sized beds. The Bright Angel Lodge was constructed in 1935 as a budget alternative to the El Tovar. Although there are no accessible rooms at the Bright Angel Lodge, it’s still worth a visit to see the Harvey House exhibit in the Bright Angel History Room. Although there are stairs up to the front entrance of this historic property, there’s also an accessible entrance on the canyon side. There’s good wheelchair access throughout the Bright Angel History Room, which features artifacts from the two Harvey Houses, as well as old photos, an 1880 Harvey House dinner gong, and even a vintage Harvey Girl uniform. It also includes information and photos from a Harvey Indian Detours excursion, which took train passengers on overnight trips to nearby Native American sites. 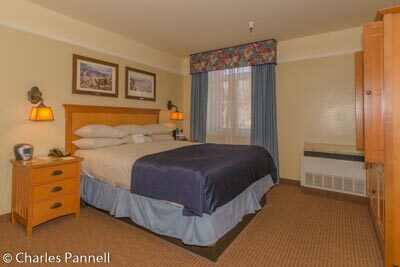 Over in Winslow, Arizona, La Posada (928-289-4366, www.laposada.org) also welcomes overnight guests. This luxury resort was added to the Harvey family in 1929, and it quickly became known as the finest lodging establishment in the southwest. And although Mary Colter received wide recognition for her Grand Canyon buildings, she always considered La Posada her masterpiece. Access is good throughout this historic property, with accessible parking in front, and a level sidewalk to the front entrance. Even though the sidewalk is a bit on the long side, there are also benches to sit down and rest along the way. Inside, there’s level access to the front lobby and gift shop, and a barrier-free pathway to room 116, which is located on the first floor. 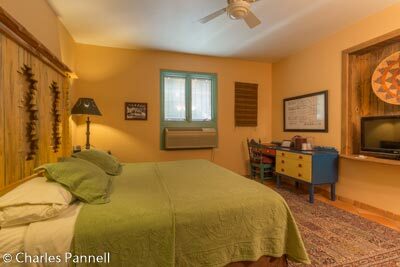 The room features wide doorways and tile floors, and good pathway access on both sides of the 26-inch high king-sized bed. It’s decorated in a traditional southwestern style and there are even some old Harvey House photos on the wall. A large roll-under sink and vanity occupy one wall of the guest room, while a desk and chair are located near the foot of the bed. 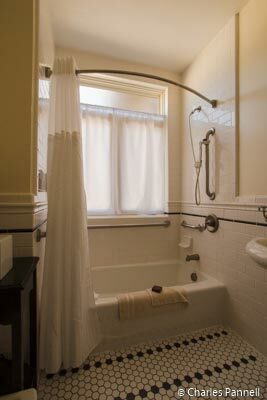 The spacious bathroom is equipped with a large roll-in shower with a hand-held showerhead and grab bars. 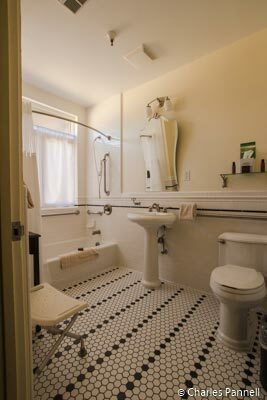 The tiled shower is very nicely done, and it’s a whopping three feet deep and nearly five feet wide. 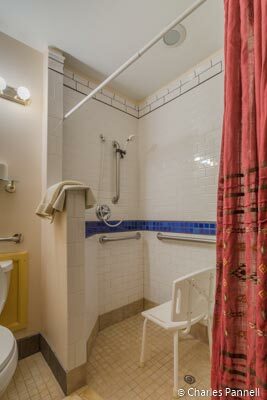 Top it off with toilet grab bars on the right and back walls (as seated), and a portable shower chair, and you have a very accessible room. Make sure and get a walking tour map when you check-in, as the property is filled with lots of nooks and crannies that contain historic photos and artifacts. Although the building lacks an elevator, the majority of the tour is on the first floor. And don’t miss breakfast in the Turquoise Room, which faces the railroad tracks and once served as the lunch room. The waitresses are dressed in traditional Harvey House uniforms, and the menu offers a good selection of southwestern and traditional favorites. Located east of Winslow, the Painted Desert Inn is easy to miss, as it’s located in the middle of Petrified Forest National Park (928-524-6228, www.nps.gov/pefo). Officially opened in 1940 on the site of the former Stone Tree House, the property once provided Route 66 travelers with food, souvenirs and lodging. 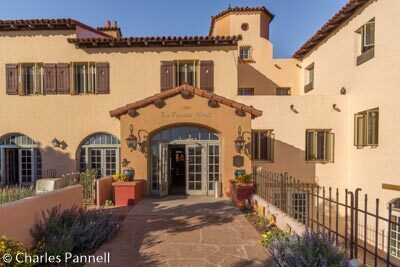 Sadly the war brought an end to the boom days and the Painted Desert Inn was closed in 1942. Five years later the Fred Harvey Company took over management and hired Mary Colter to renovate the property; and the legendary Harvey Girls were brought to the Petrified Forest. The property operated until 1963, but the inn was saved from the wrecking ball due to a massive public outcry. Finally in 1987 it was declared a National Historic Landmark, and the property was rehabilitated and returned to its former glory. Today you can see the old dining counter and lunch room, complete with vintage place settings. Access has also been improved over the years, with level access to most areas of the inn, and plenty of room for wheelchairs and scooters. The restrooms have accessible stalls, but because of heavy doors and tight turning spaces some folks may need a little assistance at the front door. After you’re done browsing through the inn, don’t miss the colorful desert view from the accessible viewpoint in back of the inn. For a good primer on Harvey House history, don’t miss the Harvey House Museum (505-861-0581, www.facebook.com/belenharveyhouse) in Belen, New Mexico. There’s level access to this 1910 Harvey House, which contained a large lunch room, a formal dining room, a newsstand and upstairs sleeping rooms for the Harvey Girls. There’s good access throughout the museum which contains lots of Harvey House memorabilia, including old photos, dishes, uniforms and even menus. There’s also a number of exhibits about the history of the railroad, and even some old railroad equipment on display. There’s no elevator access to the second floor, but the bulk of the exhibits up there focus on Belen history, rather than the Harvey Houses. As an added bonus the museum is staffed by volunteers who love to talk about the Harvey House heyday. Last but not least, don’t miss the Puye Rest House (888-320-5008, www.puyecliffs.com) near Espanola, New Mexico. Located well off the main train line in the Santa Clara Pueblo, this Harvey House was part of the Indian Detours program. Built on tribal land in the 1920s, the property hosted guests who traveled on the “Chili Line”, and were then transferred to the Santa Clara Pueblo in covered wagons in the early years, and Model Ts in later years. The tours operated from 1925 to 1939, and the big attraction of this location was the hilltop cliff dwellings in back of the hotel. Today the two buildings that made up the Harvey House are now an interpretive center and a gift shop, and although the cliff dwellings aren’t accessible, the buildings are very doable for wheelchair-users and slow walkers. The hardest part is actually finding the site. From Santa Fe, take Highway 502 to White Rock, then take Highway 30 north to Espanola. The Puye Cliffs Welcome Center (a Valero gas station) is located about five miles south of Espanola. Although numerous signs warn visitors that they can’t continue to the site without buying a pass at the welcome center, feel free to ignore them, as no such animal exists. Just take the road next to the welcome center, and once you arrive at the Puye Rest House you can purchase tickets if you decide to tour the interpretive center. There’s no accessible parking at the Puye Rest House, but there is ramp access up to the gift shop and interpretive center. There’s good pathway access through the buildings, but most of the exhibits are focused on the history of the Santa Clara Pueblo, and the excavation of the cliff dwellings in 1907. There’s also a nice view of the cliff dwellings from the back porch. And if you just want to look at the outside of this historic building, it’s definitely worth the drive. Either way, it’s a fitting finale to any Harvey House scavenger hunt through the southwest.